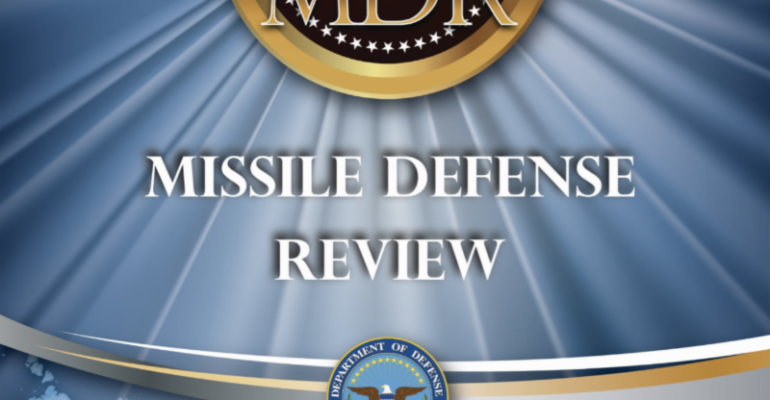 The Missile Defense Review (MDR) is the new policy for a new era, enabling maximum missile defense capabilities for the defense of the United States, its forward deployed forces, and its allies. A review of the MDR and these missile defense capabilities was presented by John Rood, the Under Secretary of Defense for Policy for the Department of Defense, and Lieutenant General Sam Greaves, Director of the Missile Defense Agency, at MDAA’s Congressional Roundtable last week and captured on CSPAN. Transcripts of the roundtable are now available for your review. The United States is putting forth new polices to maximize missile defense capabilities in place today and rapidly developing new technologies to deploy and defeat any missile targeting U.S. territory, from anywhere at any time. Below is a simplistic explanation of how the United States is maximizing our current missile defense systems by rapidly deploying missile defense capabilities and developing new future missile defense capabilities. Additionally, each section explains the threat driving the need for these advances and defenses, as well as the validity of these technologies. What is it – A new field of 20 Ground-Based Interceptors (GBIs) at Fort Greely, Alaska equipped with the Redesigned Kill Vehicle (RKV) for greater reliability and effectiveness. What is the threat driving it – Proliferation and development of North Korean and Iranian nuclear Intercontinental Ballistic Missile (ICBM) threats to the United States of America and its territories. What is the proof that it’s technically feasible – Successful intercept test of an ICBM target on May 30, 2017 from Vandenberg Air Force Base in California, validating the GMD system. Projection of when it can be up – 64 total GBIs as early as 2023. What is it – The construction and deployment of three discrimination radars to improve efficiency for GBIs and the GMD system. The first is a Long-Range Discrimination Radar (LRDR) located at Clear Air Force Station, Alaska, the second at a site to be announced in Hawaii, and the third a new missile defense radar in the Pacific region, all best positioned for increased protection of the United States homeland from the North Korean missile threat. What is the threat driving it – Proliferation of North Korean ICBM threats to the United States of America and its territories. What is the proof that it’s technically feasible – In October 2018 the LRDR completed a closed loop satellite track, verifying its capability. Projection of when it can be up – The LRDR in Alaska is expected to be operational in 2020, the homeland defense discrimination radar in Hawaii is expected in 2023, and the new radar in the Pacific is planned to be deployed by 2025. What is it – An SM-3 Block IIA interceptor that is capable of intercepting ICBMs and launched from Aegis BMD ships and land-based Aegis Ashore sites that would provide an underlayer of ICBM defense to the GMD system for the defense of the U.S. homeland. The SM3-Block IIA is co-developed by the United States and Japan. What is the threat driving it – Proliferation of North Korean nuclear ICBM threats to Hawaii and the United States West Coast and a developing Iranian ICBM threat to the East Coast. What is the proof that it’s technically feasible – ICBM intercept testing for the Aegis SM-3 Block IIA is scheduled in 2020. The Aegis SM-3 Block IIA had a successful intercept of an IRBM last month that was launched from the Aegis Ashore site at PMRF. This marked the second consecutive successful intercept test for the SM-3 Block IIA. Projection of when it can be up – The SM-3 Block IIA was designed to intercept MRBMs and IRBMs and will be deployed later this year for that mission. The SM-3 Block IIA also currently has inherent capability to intercept ICBMs, and following a successful ICBM intercept test in 2020, the Block IIA interceptor would also be assigned an ICBM defense mission. What is it – The possible emergency operationalization of the Aegis Ashore test site at the Pacific Missile Range Facility (PMRF) in Kauai, Hawaii to provide an underlayer of additional ICBM defense for Hawaii. What is the threat driving it – Proliferation of North Korean nuclear ICBM threats to Hawaii. What is the proof that it’s technically feasible – ICBM intercept testing for the Aegis SM-3 Block IIA is scheduled in 2020. The Aegis SM-3 Block IIA had a successful intercept of an Intermediate Range Ballistic Missile (IRBM) last month that was launched from the Aegis Ashore site at PMRF. This marked the second consecutive successful intercept test for the SM-3 Block IIA. Projection of when it can be up – A six-month study will be conducted to develop a plan that would allow the site to be activated within 30 days of the Secretary of Defense’s notice. What is it – Increases the number of Aegis BMD capable ships with the construction of new destroyers and the upgrade of existing Aegis destroyers with Baseline 9/10 software to add launch on remote and engage on remote (EOR) for BMD and cruise missile defense capability. What is the threat driving it – Advancing regional missile threats from near peer states Russia and China to aircraft carrier battle groups in the Pacific and Atlantic. Regional missile threats from Iran and non-state actors to Israel. Proliferation of North Korean and Iranian Medium-Range Ballistic Missiles (MRBM) and IRBM threats to allies in the Middle East, Europe, Japan, and the U.S. homeland including Guam. What is the proof that it’s technically feasible – Aegis BMD has a remarkable testing record of successful intercepts. It is currently operationally deployed on 38 U.S. ships and either directly defend or assist in the missile defense of the U.S. homeland, its forward deployed troops, and allies of Japan, Israel, Europe and the Gulf Coalition Council (GCC) member countries. Projection of when it can be up – The number of Aegis BMD ships is planned to be 60 by the end of Fiscal Year (FY) 2023 and a plan is being developed for all Aegis destroyers to be cruise missile and BMD capable within 10 years. What is it – A mobile ground-based system that intercepts Short-Range Ballistic Missiles (SRBMs), MRBMs, and IRBMs as it is integrated with Patriot and Aegis BMD. Possible deployment of additional batteries to ensure lower space and upper atmosphere defense additional land-based layer capability against current ballistic missile threats. Software upgrades to expand interoperability with air and missile defense systems and its defended area against future threats. What is the threat driving it – Proliferation of North Korean MRBM and IRBM threats to South Korea, Japan, and Guam. Proliferation of Iranian MRBM and IRBM threats to the GCC and Israel. Advancing regional missile threats from near peers of Russia and China to U.S. forward deployed troops and allies in Europe and the Pacific. What is the proof that it’s technically feasible – THAAD is operationally deployed defending Guam and the Republic of Korea today. THAAD has a successful test record against current threats, with 15 intercepts in 15 tests and upgrades have been conducted with this successful testing. Projection of when it can be up – The report of a six-month study will include potential deployment timelines. What is it – Increased and more efficient cruise missile defense capability through the development of the Indirect Fire Protection Capability (IFPC) that includes layered interceptors with different ranges and 360 degree coverage sensors. What is the threat driving it – Advanced over the horizon and maneuverable cruise missile threats from Russia and China. Iranian and Houthi, with Iran’s support, missiles and drones today targeting cities and key facilities of GCC allies from all angles (360 degrees). What is the proof that it’s technically feasible – A number of regional missile defense systems prominently, U.S. and Allied Patriot systems, Aegis BMD ships with SM-6, Israel’s Iron Dome, and U.S. Avengers, National Advanced Surface-to-Air Missile System (NASAMS), and Counter-Rocket, Artillery, and Mortar (C-RAM) forward deployed, currently have capability to defend against 360 cruise missile threats. Projection of when it can be up – Initial operational capability of the IFPC Block 1 is expected in 2023. What is it – Building significantly more cooperation with allies and partners to increase collaboration to include development on missile defense programs, increasing interoperability with missile defense systems and operations, and increasing the allies’ own missile defense capabilities and capacity. What is the threat driving it – Advancing regional missile threats from near peer states from Russia and China. Regional missile threats from Iran and non-state actors to Israel. Proliferation of North Korean and Iranian MRBM and IRBM threats to allies in the Middle East, Europe, Japan, Republic of Korea and the U.S. homeland including Guam. How feasible is it – Burden sharing exists at some levels between the United States and 19 allied and partner nations on missile defense. The most significant cooperative effort and example of mutually beneficial burden sharing has been with Japan, which the U.S. is co-developing and producing an advanced version of the SM-3 interceptor, the SM-3 Block IIA. What is it – Space-based sensors will be able to globally monitor, detect, discriminate, and persistently track missile launches at any point on the earth, in the air, and in space by utilizing extreme flexibility, mobility, and advanced sensor technology. Space-based sensors provide enhanced capability to track, discriminate, and target more complex missile threats such as the Hypersonic Glide Vehicles (HGVs) and enable more effective and efficient use of interceptors against current and advanced threats. What is the threat driving it – Sensor gaps in the currently deployed terrestrial based sensor coverage and the need for persistent global overhead sensor coverage against current and proliferating missile threats, both advanced and new offensive missile technologies, such as HGVs. Proliferation of ballistic and non-ballistic missile threats by North Korea and Iran, as well as near peer states (Russia and China). What is the proof that it’s technically feasible – Major improvements in technologies applicable to space basing and the cost efficiency of commercial space vehicles have made the capability cheaper and more feasible as demonstrated by the Missile Defense Agency’s (MDA) developed, launched, and deployed Space-based Kill Assessment (SKA) constellation. What is it – The development of a hypersonic glide vehicle defense capability by leveraging existing missile defense technologies as well as emerging new technologies. What is the threat driving it – Hypersonic glide vehicle testing and development by Russia and China. What is the proof that it’s technically feasible – Unknown at this point of time. Projection of when it can be up – A six-month study will identify the requirements necessary for developing this capability, but the timeline could be shortened by leveraging current developments by the Defense Advanced Research Projects Agency (DARPA) and the U.S. Air Force. What is it – The F-35 is a fifth generation aircraft with the most advanced integrated sensor package of any fighter aircraft in history, capable of detecting missiles launches in any direction with six passive sensors and transmitting tracking data to the Joint Force. What is the threat driving it – Proliferation of North Korean and Iranian ballistic missiles. Proliferation of near peer Russian and Chinese regional ballistic and non-ballistic missiles that are creating a more dynamic and immediate missile threat environment for U.S. forward deployed troops and allies. What is the proof that it’s technically feasible – An F-35 flying over the capitol region detected and tracked a space rocket launch with its passive sensors over 800 miles away in Cape Canaveral, Florida in 2010. Projection of when it can be up – A six-month study will report on how to integrate the F-35 into the Ballistic Missile Defense System (BMDS). What is it – Intercepting ballistic missiles during their boost-phase of flight, only a few hundred seconds long, with an air-to-air interceptor launched from an F-35 with its own sensors and fire control. Included with this is the rapid development of a new faster and longer-range air-to-air interceptor for additional standoff range and battlespace for the F-35. What is the threat driving it – Proliferation of North Korean and Iranian ICBM threats to the United States of America and its territories. What is the proof that it’s technically feasible – A sounding rocket was intercepted in its boost-phase by a sidewinder missile from an F-16 aircraft at the White Sands Missile Range in New Mexico in 2007. Projection of when it can be up – A six-month study will report on how to integrate the F-35 into the BMDS but boost phase interception will require the development of a new interceptor. What is it – The integration of advanced sensors onto an Unmanned Aerial Vehicle (UAV) to track ballistic missiles in their boost- and midcourse-phase and cruise missiles from overhead. What is the threat driving it – Current persistent gaps in the deployed terrestrial sensor architecture. Proliferation of North Korean and Iranian nuclear ballistic missile threats to the U.S. homeland, forward deployed troops, and allies. Proliferation of near peer Russian and Chinese, and rogue states like Iran, regional ballistic and cruise missiles that are creating a more dynamic and immediate missile threat environment for U.S. forward deployed troops and allies. What is the proof that it’s technically feasible – In 2016, two MQ-9’s tracked a ballistic missile target during the Pacific Dragon missile defense drill and are being used in U.S. missile defense tests. Projection of when it can be up – Testing with them now. What is it – A potential additional GBI site located in the Continental United States when the Iranian nuclear ICBM threat materializes to be a valid threat to the United States. This will also include redundant discrimination sensors on the east coast and forward deployed in Europe for the Iranian ICBM threat. What is the threat driving it – Proliferation of Iranian nuclear ICBM threats to the United States of America. What is the proof that it’s technically feasible – Successful intercept test of an ICBM target on May 30, 2017 from Vandenberg Air Force Base in California, validating the GMD System. DoD has already prepared Environmental Impact Statements evaluating several candidate locations and the site would be similar to the current GBI site at Fort Greely, Alaska with additional GBIs. Projection of when it can be up – Should the U.S. determine the third site is needed to defend against Iranian nuclear ICBMs, the completed studies and Environmental Impact Statements will enable DoD to shorten the deployment timeline. What is it – The United States will pursue greater integration of attack operations with active and passive missile defenses across all domains and systems. What is the threat driving it – Hostile near peer Russian and Chinese Anti-Access/ Area Denial (A2/AD) environments and the proliferation of North Korean and Iranian ballistic missiles, where they seek to use ballistic and cruise missiles to coerce both in peacetime and crisis, and to overwhelm U.S. forces in the event of conflict. How feasible is it – Used and proven in combat in Israel and in place at U.S. Air and Space Operations Centers (AOCs) around the globe. Requires a dynamic and cross-domain command and control, battle management system. When can it be expected to be up – Another requirement from the 2017 National Defense Authorization Act is the designation of an office with acquisition authority specific to pre-launch attack operations. That agency must be identified within six months; after that happens, a larger review will begin to examine roles and responsibilities for updating operational doctrine in terms of left-of-launch strikes. What is it – The Multi-Object Kill Vehicle (MOKV) is a next generation kinetic kill vehicle with multiple kill vehicles on one GBI that is designed to provide the ability to engage multiple ICBM warheads, decoys, and countermeasures using a single interceptor. What is the threat driving it – Advancing nuclear ICBM threats from North Korea and Iran equipped with countermeasures and Multiple Independently Targetable Reentry Vehicle (MIRV) capabilities. What is the proof that it’s technically feasible – A test of the Multiple Kill Vehicle (MKV), an earlier program with the same function as the MOKV, in 2008 that demonstrated the MKV’s ability to monitor a potential target. What is it – The integration of a scalable, efficient, and compact high energy laser and/or a kinetic air-to-air interceptor on a UAV to track and destroy ballistic missiles in their boost-phase. What is the threat driving it – Proliferation of North Korean and Iranian nuclear ICBM threats to the United States of America and its territories. What is the proof that it’s technically feasible – Unknown. Projection of when it can be up – MDA is currently developing a Low-Power Laser Demonstrator to determine the necessary technologies to mount a laser on a UAV. Also, the six-month study that will report on how to integrate the F-35 into the BMDS and the possible requirement of a new interceptor could also potentially be used on a UAV platform. What is it – A space-based interceptor layer using kinetic interceptors for operational capability against HGVs and ballistic missile defense in the boost and midcourse phases of flight. What is the threat driving it – Chinese and Russian development of HGVs. Proliferation of North Korean and Iranian nuclear ICBM threats to the United States of America and its territories. What is the proof that it’s technically feasible – Current U.S. missile defense systems, the GBI, Aegis BMD, and THAAD intercept threat missiles in space with kinetic interceptors. Major improvements in technologies applicable to space basing and the cost efficiency of commercial space vehicles have made the capability cheaper and more feasible to put in place. Projection of when it can be up – A six-month study will look at the development and fielding of a space-based interceptor layer. What is it – The development and fielding of high-powered directed energy weapons for a revolutionary cost effective and generational change for cost per intercept, changing the cost curve of missile defense. What is the threat driving it – Today’s high cost of missile defense kinetic interceptors combined with the proliferation of North Korean and Iranian nuclear ICBM threats to the United States of America and its territories. What is the proof that it’s technically feasible – Unknown – A number of successful tests of a low-powered directed energy weapons have been conducted. Projection of when it can be up – Mid- to late-2020s. Within nine months of the MDR release, a study will be conducted of the command and control capabilities and concepts of operation needed to provide early warning and attack assessment for advanced ballistic missile, cruise missile, and HGV threats. Within six months of the MDR release, a recommendation will be made for an organization that will be designated by the Secretary of Defense to have acquisition authority for U.S. capabilities to defense against cruise missiles. Within six months of the MDR release, a report will be released that provides an assessment of the required number of THAAD batteries to support worldwide THAAD deployments. Within six months of the MDR release, a plan will be delivered to convert all Aegis destroyers to be fully missile defense capable within 10 years. Within six months of the MDR release, a plan will be delivered to accelerate efforts to enhance missile defense tracking and discrimination sensors, to include addressing advanced threats. Within six months of the MDR release, a report will be delivered on how best to integrate the F-35, including its sensor suite, for both homeland and regional defense. Within six months of the MDR release, an Emergency Activation Plan will be delivered to operationalize the Aegis Ashore test site in Hawaii within 30 days of a decision to do so by the Secretary of Defense. Within six months of the MDR release, a report on the development and fielding of a space-based missile intercept layer will be developed. Within six months of the MDR release, a plan identifying the resources, testing, and personnel requirements necessary for defense against hypersonic threats will be created. Within six months of the MDR release, a review and determination will be made on if there is a need for improvements to the capabilities development process of the Warfighter Involvement Process (WIP). Within six months of the MDR release, a recommendation will be made regarding optimal roles, responsibilities, and authorities for achieving greater transregional missile defense integration. Within six months of the MDR release, an organization will be identified to review and update operational doctrine regarding the role of pre-launch attack operations in Joint IAMD doctrine.